It is important not to overlook the very real economic war being waged by the U.S. and its allies in Venezuela and throughout Latin America. This morning I saw the sun rise over Venezuela from 30,000 feet, my flight descending to Caracas in the early dawn light. As the darkness retreated, a rugged, majestic coastline came into view: the small waves lapping against the rocky shore, perceptible only by a thin streak of white foam set against the dark brown of rock, and deep green of the lush hillside just above it. This was my first glimpse of Venezuela, a country I have been following since the early days of my political development, when a man named Hugo Chavez was elected and shook the very foundations of Latin America, challenging the hegemony of the U.S. Empire in its own “backyard.” Soon I was in the airport, sipping strong coffee from a small plastic cup with a few members of my delegation from the U.S. and Canada. We all came to the Bolivarian Republic to bear witness to the all-important elections scheduled to take place Sunday, as well as the violence and destabilization that is likely to follow if the U.S.-backed opposition loses. From the back seat of the car taking us from the airport to the center of Caracas, I gazed out the window, drinking in the landscape, the people, the juxtaposition of modern public housing high rises and small, dilapidated homes lining the hillsides. But as I observed the surroundings, there was one pair of eyes that seemed to be gazing back: El Comandante. Chavez is larger than life in Venezuela, a country where “Chavismo” is both a movement and an ideology, one rooted in the legacy of this hero and leader, even in death. His face adorns billboards. His signature is plastered on the sides of buildings. His eyes have literally come to be the symbol of the PSUV, the Venezuelan socialist party that he built into a political force in the Bolivarian Republic (also a Chavez creation) and throughout Latin America. But one cannot help but be struck by the difficulties the country now faces. Many basic necessities of life such as deodorant, sunscreen, and toilet paper are either missing from store shelves, or are in such short supply that lines wrapping around the block are a common sight at busy drug stores in the city. Inflation has wreaked havoc on daily life for ordinary Venezuelans who have been forced to wait for hours at the ATM just to withdraw Bolivars whose official exchange rate is 6.5 to 1 U.S. dollar, while the unofficial rate is hovering around 800 to 1. Even the cafes and restaurants that line the major avenues of Caracas are often out of basic foods such as beans, pork, and more. For someone with visions of hot, steaming arepas (Venezuela’s signature food) filled with juicy pernil (shredded pork) dancing in my head in the days leading up to my trip, the lack of such staples was a major realization of just how dire the economic situation has become. The majority of Venezuela’s imports and distribution networks are in the hands of the elite, the same elite who once also controlled the government until 1999 and Chavez’s ascendance. Many of the goods needed for Venezuelan consumption are diverted to Brazil and Colombia. We are experiencing manufactured scarcity, a crisis deliberately induced as a means of destabilization against the government. For example, we have a huge company that processes chicken, the majority of chicken for the country in fact. That chicken company closed but continues to pay employees to do nothing, deliberately reducing the supply of chicken in the country in order to deprive the people of this critical staple food. 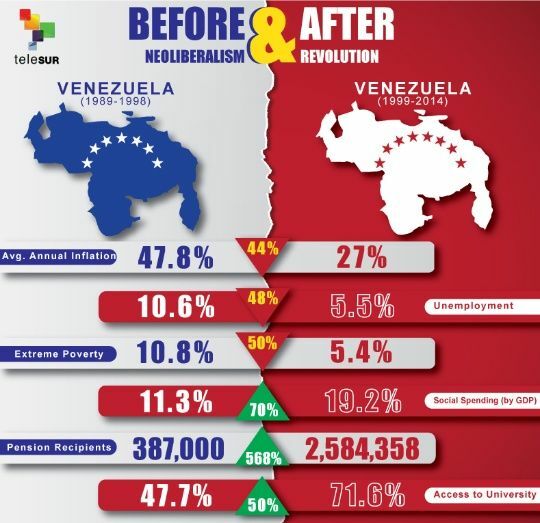 This is psychological war waged against the people of Venezuela in an attempt to intimidate them into abandoning the government and the socialist project entirely. Of course it is difficult to convince a mother with three children and no chicken for dinner that she should consider the political, economic, and psychological dimensions of the issue. Just as it is easy to understand the frustration even of government supporters as they wait on line just to get cash whose value diminishes by the day. But these aspects of the situation are critical to understanding the broader context within which Venezuela is now operating, the new reality that has been thrust upon it. I have heard stories of foreigners coming to Venezuela in recent months and changing a small amount of dollars or euros or yuan for a mountain of bolivares. While artificial scarcity is one element in the larger strategy to destroy Venezuela, an equally important component is the manipulation of currency in an attempt to instigate hyper-inflation. I can already see the emails from people lecturing me about the finer points of economics, chastising me for “apologia” on behalf of President Maduro and the government, absolving them of their ‘sins’ of economic mismanagement and corruption. The truth is though that the government cannot, and does not, control the economy to the point of being able to stop speculation which continues to drive the currency through the floor. Here again Julio Escalona succinctly stated the all-important truth, “Our currency is not being devalued by speculation, but by hyper-speculation.” This sort of economic warfare can be understood by looking at the statistics, but it can also be felt on the streets. The people, millions of whom will still vote for leftist pro-government parties on Sunday, are struggling, their standard of living has decreased almost as fast as the price of oil has collapsed. And the correlation between those phenomena is not merely incidental. Listening to the corporate media, one would think that Venezuela was a barbarous place where men, women and children are gunned down in the streets for seemingly no reason. One could be forgiven for envisioning a city where murals of Che and Chavez are exceeded only by the chalk outlines of dead bodies on every street corner. However, the truth is that the violence and crime – both very real phenomena – are symptoms of the larger affliction: economic and psychological war. 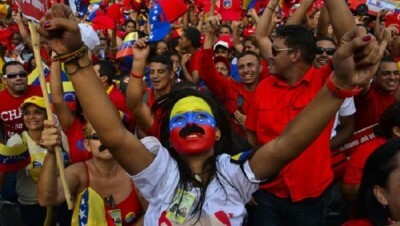 The enemies of Venezuela, both in the country and in the U.S., foment just this sort of crime and violence in order to manipulate the collective consciousness of the people in an attempt to coerce them into abandoning the Bolivarian Revolution in favor of a right-wing, pro-U.S., pro-IMF, neoliberal ruling class that will theoretically restore order and guarantee safety. Ultimately, that’s what this Sunday’s election is really about: courage in the face of intimidation. Venezuela is not always as beautiful as it appears from an airplane window. It is a country fighting for survival against the Empire, such fights are rarely pretty. But in doing so, Venezuela is also fighting on behalf of all countries targeted by the U.S. And that is truly something beautiful. Eric Draitser is an independent geopolitical analyst based in New York City. He is the editor of StopImperialism.org and host of CounterPunch Radio. You can reach him at ericdraitser(at)gmail.com.